Dia Art Foundation strikes a perfect balance in pairing the late German conceptualist Hanne Darboven with Kishio Suga, founder of Mono-ha (School of Things) and Japan’s foremost sculptor in the latter’s first solo museum exhibition in the US. Both are closely aligned to cultural and societal movements that defined the 1960s and 70s, a period that saw the emergence of post-minimalism, land art and arte povera, and a focus of Dia’s collection. Hanne Darboven’s Kulturgeschichte 1880–1983, a reinstallation of her magnum opus, consists of 1,590 sheets in a grid formation. 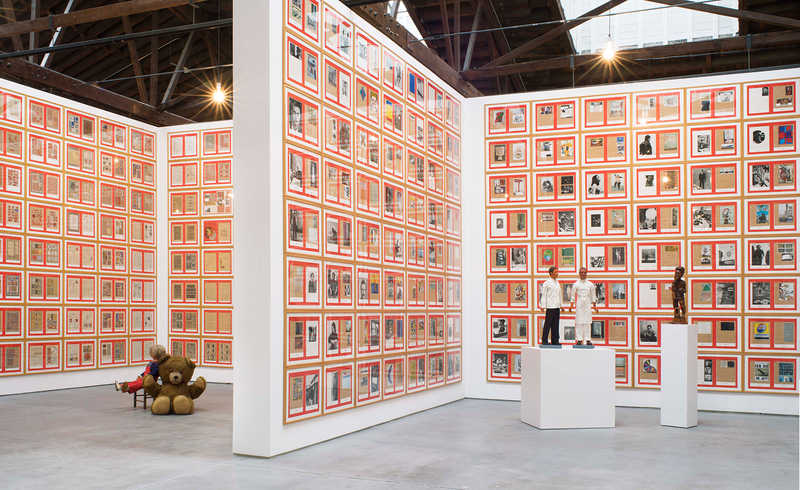 Filtering personal history alongside a sweeping record of historical events, weaving in cultural and social issues of the day, Darboven used everyday objects, found materials, photographs and newsworthy items such as Der Spiegel covers with 19 strategically placed sculptural elements. Darboven referred to herself as a writer, but dismantled the written word. She devised Konstruktionen, a series of complex linear numeric concepts (influenced by her musical training) used as a non-descriptive artificial language for transcribing words. Darboven’s inventiveness didn’t stop there. Concerns with time and space lead to the formation of patterned text images handwritten in a cursive script, a u-shaped letter, repeated multiple times. Next door, Kishio Suga’s Law of Halted Space (2016) is a commissioned, site-specific installation that responds to the building’s natural surroundings. A group of wooden rods of varying height spaced irregularly are bound with steel to create an interdependent stable network. Arranged to resemble a labyrinth, visitors can duck under for a meditative walkthrough. Earlier works show Suga’s concern with balance in countering external forces and his use of elemental materials.